Docklands has not only benefitted from its modernity, but also from the significant development efforts that have been ongoing in the suburb since the Victorian Government wisely decided to not only reinvigorate the prime real estate harbour-side, but completely transform it. Fast forward less than two decades and Docklands is indeed unrecognisable from the under-utilised, almost desolate industrial area that it had become by the 1990s. Today, Docklands is Melbourne’s architectural centrepiece with new buildings being developed or constructed at any given time. Harbour Kitchen’s function rooms are ideally placed at both street and water level, taking advantage of both the natural beauty of the ocean and the impressive man-made infrastructure that makes up Melbourne’s CBD. Being beside the sea, it makes sense that much of Docklands architecture includes a nautical element or two and the NAB building that we inhabit is no different. Four tall columns stand atop the building like masts or chimneys rising from the deck of a boat. Below bright splashes of colour, reminiscent of a Mondrian artwork, reflect the thriving, festival atmosphere that is so often present in Docklands. 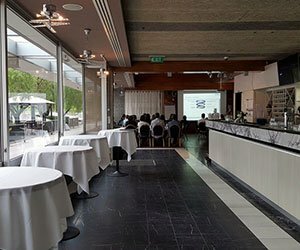 If stylish function rooms set amongst dozens of stylish buildings are what you are looking for, you won’t find a better venue than Harbour Kitchen. We love our location in the epicentre of Docklands and we know you will too.